Rafting New Zealand on the Tongariro River. Splash, Crash, Swim & Laugh, this trip is all about having fun while travelling through the beautiful lower reaches of the Tongariro River. Departing daily, this is a great adventure for families with younger children, our more senior of citizens and non-english speaking visitors alike. Hold On – Get Down – Get ready to Scream! 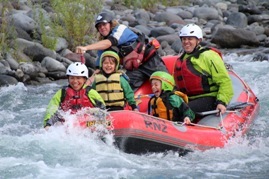 – With Rapids like the “Rollercoaster” and “Mothers Nightmare”, the Wairoa River produces the most action packed Grade 5 rafting in the country. 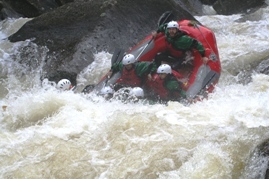 If you want to experience the most thrilling whitewater action, then the Wairoa River is the rafting adventure for you! All on river apparel is provided (all you need is your swimsuit and towel), your “kiwi” professional river guide will keep you safe and give you a great time – come experience the thrill of rafting – Aotearoa styles! 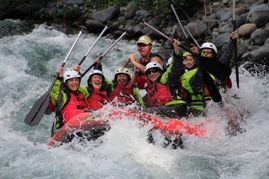 Please contact us NOW for any further information on Rafting New Zealand.